A device that blocks current in one direction while letting current flow in another direction is called a diode. Diodes can be used in a number of ways. For example, a device that uses batteries often contains a diode that protects the device if you insert the batteries backward. The diode simply blocks any current from leaving the battery if it is reversed, this protects the sensitive electronics in the device. Diodes are the simplest possible semiconductor device, and is therefore an excellent beginning point in understanding how semiconductors work. First, before describing how a diode works, it is important to understand the basic components in diodes. N-type - In N-type doping, phosphorus or arsenic is added to the silicon in small quantities. Phosphorus and arsenic each have five outer electrons, so they’re out of place when they get into the silicon lattice. The fifth electron has nothing to bond to, so it’s free to move around. It takes only a very small quantity of the impurity to create enough free electrons to allow an electric current to flow through the silicon. N-type silicon is a good conductor. Electrons have a negative charge, hence the name N-type. P-type - In P-type doping, boron or gallium is the dopant. Boron and gallium each have only three outer electrons. When mixed into the silicon lattice, they form “holes” in the lattice where a silicon electron has nothing to bond to. The absence of an electron creates the effect of a positive charge, hence the name P-type. Holes can conduct current. A hole happily accepts an electron from a neighbor, moving the hole over a space. P-type silicon is a good conductor. N-type and P-type silicon are not that amazing by themselves; but when you put them together, you get some very interesting behavior at the junction. That’s what happens in diodes. Diodes are the simplest possible semiconductor device. A diode allows current to flow in one direction but not the other. When you put N-type and P-type silicon together, you get a very interesting phenomenon that gives a diode its unique properties. Even though N-type silicon by itself is a conductor, and P-type silicon by itself is also a conductor, the combination shown in the diagram does not conduct any electricity. The negative electrons in the N-type silicon get attracted to the positive terminal of the battery. The positive holes in the P-type silicon get attracted to the negative terminal of the battery. 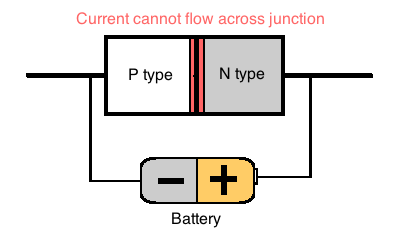 No current flows across the junction because the holes and the electrons are each moving in the wrong direction. If you flip the battery around, the diode conducts electricity just fine. The free electrons in the N-type silicon are repelled by the negative terminal of the battery. The holes in the P-type silicon are repelled by the positive terminal. At the junction between the N-type and P-type silicon, holes and free electrons meet. The electrons fill the holes. Those holes and free electrons cease to exist, and new holes and electrons spring up to take their place. The effect is that current flows through the junction. When reverse-biased, an ideal diode would block all current. A real diode lets perhaps 10 micro amps through — not a lot, but still not perfect. And if you apply enough reverse voltage (V), the junction breaks down and lets current through. Usually, the breakdown voltage is a lot more voltage than the circuit will ever see, so it is irrelevant. When forward-biased, there is a small amount of voltage necessary to get the diode going. In silicon, this voltage is about 0.7 volts. This voltage is needed to start the hole-electron combination process at the junction.